Juice Fasting Diet is a life-change exercise for me. My fasting journey started with a six-day juice fast. To start with, I prefer juice to water for one reason – I like to have some taste, sweetness and at least something rather than nothing in my mouth. May be for this reason, people generally can stay through the first three days without much problem. In fact, there were more scientific reasons to backup my choice, but at that moment in time, I didn’t know. If you want to try juice fasting, let me walk you through some basic facts. While juice fasting, the stomach actually shrinks to its original size (the size of your fist). When you just drink your food, your stomach gets a physiological rest, allowing the colon to shed old compacted and putrefied material that was waiting there to cause future disease. Hence juice fasting is not only responsible for weight loss, but detoxifying and rejuvenating our digestive organs. Please always include fresh raw fruits and vegetables. They require no digestion & almost all their vital nutrients are assimilated directly in the bloodstream. 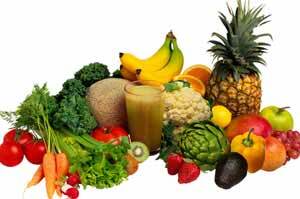 Raw juices of fruits & vegetables are extremely rich in vitamins & minerals, trace elements, enzymes & natural sugars. They exercise beneficial effect in normalizing all the body functions. They supply needed elements for the body's own healing activity & cell regeneration thereby speeding the recovery. If you are technically interested in the nutrition value and benefits of the juice fasting fruits and vegetable juices, you may look up the internet and spend a few days reading overwhelming information. I’m not a technical person, so my suggestion for juice fasting diet is by color rotation. I’m sure you won’t miss anything in terms of nutrition. And that was exactly how I did it myself. Here are some of the fruits and vegetables generally available, delicious and economic. I’m sure you’ll love some, if not all of them. Acid fruits like orange, lemon, grapefruit, strawberry and pineapple. Sweet fruits such as prunes and grapes. Sub-acid fruits like apple, plum, pear, peach, apricot and cherry. Vegetable fruits, namely, tomato and cucumber. Green leafy vegetables like cabbage, celery, lettuce, spinach. Root vegetables like beetroot, carrot, onion, potato and radish. Make the juices yourself to guarantee freshness. Drink immediately after the juices are made. If you don’t have a juicer at home yet, buy one. A simple inexpensive home juicer will do. If your office has a pantry, keep a juicer there as well. Make your own juice whenever and wherever possible and drink them fresh. It is desirable to use juices individually. If you prefer to mix, I would suggest no more than three juices in any one mixture. Anybody – whoever wants to start a new and healthy life. But you may say that ‘if it is easy, then everyone would be doing it.’ Right, each year, millions of people attempt to take control of their weight and health. And each year millions of people fail. If you don’t want to be the next one, you need to find out more about juice fasting and seek support from people with successful experience. Generally people who suffered from pain and got recovered will share their experiences and hope to help others who had been suffering from similar pain. For me, I create this website to share my fasting experiences. For Kate West, she has taken her years of overweight/unhappy experience into a simple handbook called Breakthrough Juice Fasting, in which she takes you by the hand and show you step-by-step how to do juicing fasting. FYI, Kate after mastering this system became a detoxification consultant and enjoying great joy in helping others to go through the journey she had.